I've decided to become at least an occasional reviewer for Thomas Nelson. And I'd highly recommend it... check the link on the right side of my blog. 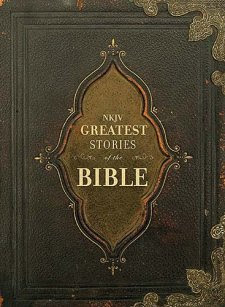 One day I clicked through to their site to see that they were looking for people to review the NKJV Greatest Stories of the BIBLE for them. I checked out the links, and knew I really did want this book. So I signed up. I had seen the cover shot (shown here!) but that didn't do justice to the book. When I opened the package, I was impressed... it just looks so much like that old family Bible. It looks creased, worn, and well-loved, with an attached ribbon bookmark. Once I got inside this Bible, I loved it even more. This is a "story" Bible in the sense that it is broken up into stories -- 250 of them, in fact. But it is a "real" Bible in that it is using real Bible text. What do I mean by that? Well, let's jump to the New Testament ('tis the season) and take a look. Story #204 is called "Jesus Before Time" and it consists of the text of John 1:1-18. This is one of the shorter stories, being only one page (most stories are 2-3 pages). It starts off with "In the beginning was the Word, and the Word was with God, and the Word was God. 2 He was in the beginning with God." And so on. Yes, verse numbers, just like you would expect in a real Bible, but wouldn't expect in a "story" Bible. Now, these stories don't necessarily go straight through the Bible, including everything. If we jump forward a couple of stories, we read "John the Baptist Arrives" which is Luke 1:5-25, 39-45, 57-80. They double space between the paragraphs where they jump over verses, so if you want to figure it out, you have a visual clue that something is missing. Being a story Bible, it does not hit all of the Bible equally. As you'd expect, there are lots of stories from Genesis and Exodus, and not many from the prophets or the epistles. Basically, 3/4 of the book covers Genesis, Exodus, Joshua, Judges, 1st and 2nd Samuel, 1st and 2nd Kings, and the Gospels. Being a story Bible, I expected pictures. But I wasn't exactly disappointed to find that there aren't any. I like this format. We’ve read through the Bible in a year. We’ve read through a chronological Bible in a year. When the older guys were younger, we read through a more traditional story Bible in a year. You can find this Bible at Amazon, Christian Book (at $20, this was the best price I found), and other places. I’m thrilled to be using it. Disclaimer: As Thomas Nelson Book Review Blogger, I did receive this book for free from Thomas Nelson. The fact that I received a complimentary product does not guarantee a favorable review. It does guarantee a review. A fair review. But I am not going to praise something unless I think it deserves the praise. If I don't like it, you'll hear that. And hopefully with enough detail as to why so you can decide for yourself if what I hate about it makes it perfect for your family. For more about my take on reviews, visit my blog post here. I reviewed it as well, and I was equally impressed! I like your idea of using it Monday through Friday! We bought the book that we have new, but it was written a long time ago, so I'd like to look at this one to see if it's a little more "readable" than the one we have. Karla -- just read your review and commented! You are so concise! I just ramble on and on! Carrie -- I too adore the "old" look. It reminds me of reading my grandma's Bible to my kids. Only I wouldn't dare to do that, because hers is nearly falling apart. But every time I pick this Bible up to read, I think of her. Go check Mardel's, I'm sure you could get a look at it there. Probably less expensive to order it online, but I haven't priced regular books there. Well, I had to rush over and leave you a comment, and your post intrigued me. From what I gather this would not be a study bible, but something that you could read to your younger kids, right? And how do you make time to review for TN and the Crew? Michelle -- you are too funny! And no, this isn't a study Bible, but something you can read to the kids. I don't know what I wrote above, but my 3 year old tends to tune out of this. My 5 year old enjoys it. I'd say somewhere around Kindergarten and up. As for my 3 year old, well, my usual philosophy with Bible reading is to let the preschoolers get whatever they get from what the rest of us do, and to pull out a picture filled book periodically (like Peter Spier's stuff) to get something on their level sometimes. As for time... well, this is the only one I've done for TN. I have no intention of pumping these out too frequently. It was just that I saw this and had to have it :) I'm definitely going to stick to things that I don't think are going to be terribly complicated to review, and I'll most certainly be choosy while on the Crew.